The Sophie 63 was created by Monaco based Sophie Yachts and built in China by Jet Tern Marine. 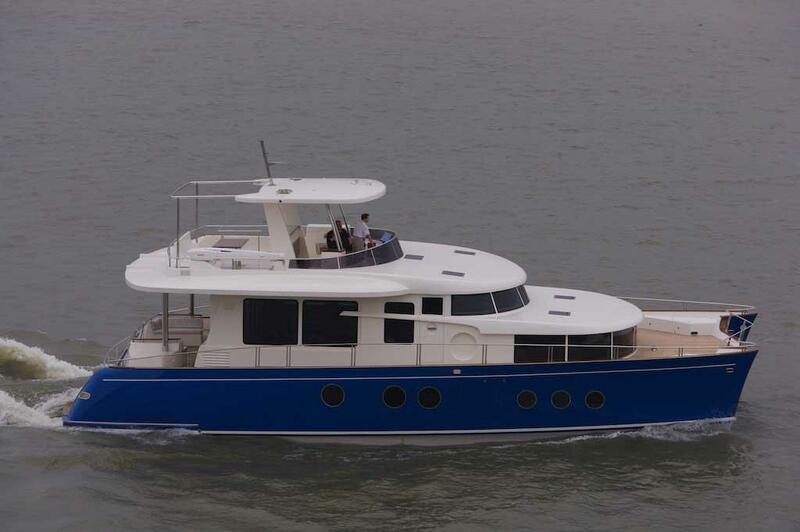 Launched in 2008, she is now available for sale with Windward Island Global Maritime Yacht and Ship Brokers. The Sophie 63 was designed by VPLP together with the famous yacht designer Richard Hein (the founder of Oceanco yachts and now Vega Yachts) and the famous interior designer Olivier Gibault founder of Igloo Architectures and designer of many 4 stars hotel including the Monaco Novotel. 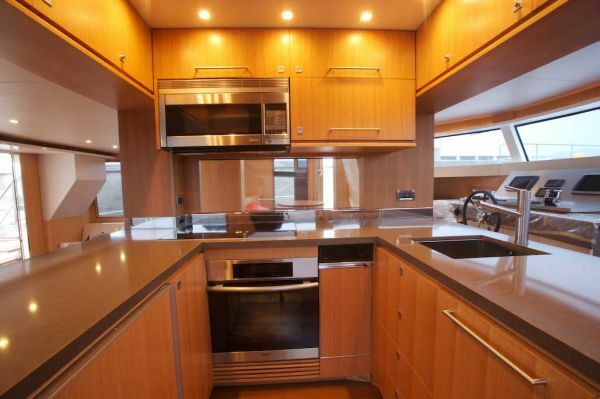 This luxury catamaran really has a great pedigree. 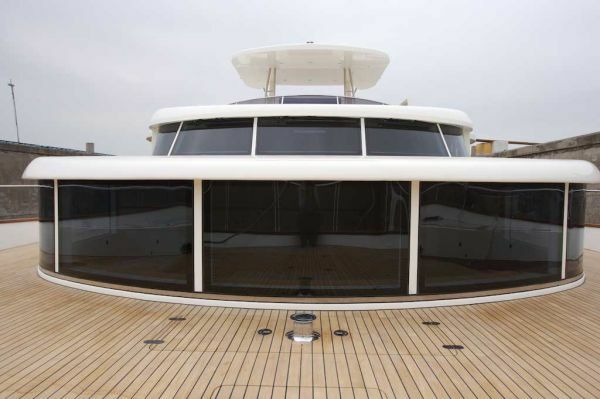 SOPHIEYACHTS catamarans offer 35% greater space than any classic motor yacht of the same length. 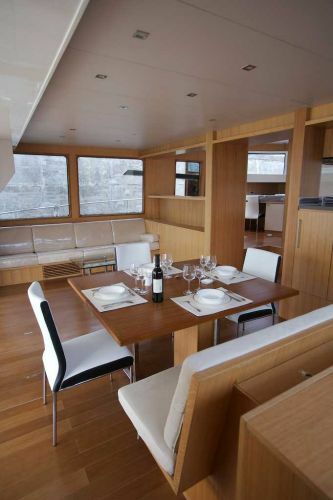 The greater width of the hulls creates more room, enabling a larger and superior living space. Most of the living space is situated above sea level, which allows for more windows and great luminosity. The flybridge is inspired from larger mega yacht designs… There is a bar area which converts into a relaxing lounge area!Guests will be able to gather for meal times, or alternatively relax and tan on the sofas. Yet, another advantage of the Sophie 63 is its aft deck, which offers an exceptional social area with an adjustable table and large couches facing the sea. The owner suite is very wide with a great view on the sea on the boat’s main deck, a feature mainly seen on much larger yachts. 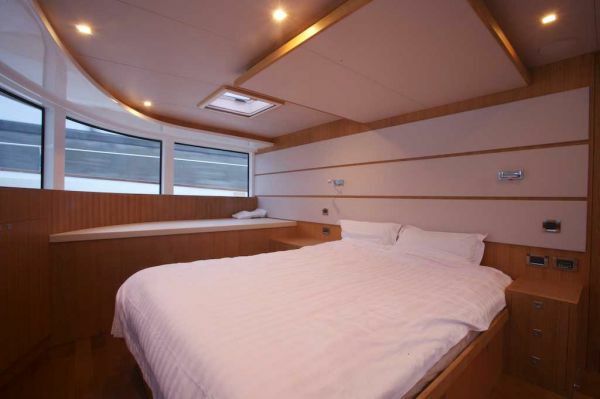 The living spaces (145 m²) also welcome two double en-suite guest cabines, crew quarters as well as a very large salon with a fully equiped u-shaped galley . The efficient hull is powered by 2 Caterpillar engines 1000 hp for a cruising speed of 22 knots with a reduced draft of only 1 m 45. This Sophie 63 in 2008 and is located in China. Learn more about her on yacht world. This entry was posted in jet tern marine, richard hein, sophie 63, sophie yachts, vplp. Bookmark the permalink.